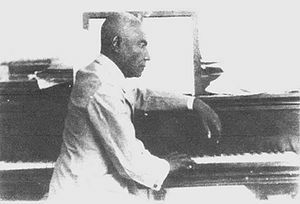 Ludovic Lamothe (1882-1953), known as “Black Chopin” and as the “last true Romantic,” is one of Haiti’s best-known composers for piano. Lamothe’s music drew on both elite and folkloric styles, including compositions inspired by the music of Haitian Vodou, by the Haitian méringue and other dance forms, and by the music of Frederic Chopin, whose music Lamothe performed. Lamothe composed exclusively for his own instrument, piano. Below, listen to a recording of Charles P. Phillips performing works of Lamothe.